September 7, 2016 – Advantech (TWSE: 2395.TW) today unveiled an expanded range of low power PCI Express video accelerator cards that can be integrated into commercial IT/PC server-based media applications to offload heavy-lifting video processing tasks in UHD video infrastructure solutions. The new entrants include a single board 8Kp60 HEVC encoder, and two next generation boards that can support real-time, high quality professional grade HEVC, AVC or MPEG-2 encoding, decoding, and transcoding with up to 10 bit colour depth and 4:2:2 chroma sampling. The new VEGA-3310 and VEGA-3311 are both high performance low power video processing accelerators in a half-length PCI Express form factor. The VEGA-3311 is fitted with video acquisition interfaces and can manage up to 4Kp60 real time encoding and decoding with scaling and pre-processing, and supports H.264 and MPEG-2 standards as well as an improved HEVC capability that includes higher quality and very low latency modes. 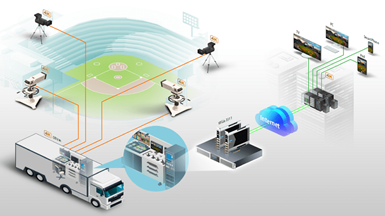 To support the move to an all-IP workflow, a version of VEGA-3311 is available with a dual 10 Gigabit Ethernet live Media over IP interface option in addition to traditional quad-SDI based video interfaces. The VEGA-3310 has no dedicated video interfaces but instead features enhanced processing capacity for file or PCI streaming offload applications. It can support dual channel 4Kp60 or high frame rate encoding up to 4Kp120, and multiple cards can be configured to support up to 8K/UHD-2 HEVC encoding. In addition, this event sees the debut of the new VEGA-3304 which is a real-time 8Kp60 HEVC encode accelerator in a PCI Express long card form factor and can optionally be fitted with a 16 x SDI-3G video acquisition expansion card. The enhanced video processing capability will feature throughout the VEGA product portfolio, including the new VEGA-6311, a next generation version of the VEGA-6301 Compact All-in-one Encoder Appliance, and the new accelerators can improve the HEVC performance of the VEGA-7000 Video Server to 1 channel of 8Kp60, 8 channels of 4Kp60 or 16 channels of 1080p60 in a short depth 1U rack mount form factor. Advantech will be showcasing the new boards in IBC booth # 11.C22, September 9-13, 2016 in Amsterdam. For more information and to book an appointment, please contact video.solutions@advantech.com or visit www.video-acceleration.com. VEGA-2000 is a small form-factor module designed for encoding live video using either advanced HEVC (High Efficiency Video Coding) Main Profile or H.264 BP/MP/HP video compression up to 1080p resolution at 60 frames per second, with CBR (Constant Bit Rate) & VBR (Variable Bit Rate) support from 64kbps ~ 32Mbps. The single SDI-3G or HDMI video inputs provide video capture capability in convenient formats for professional video feeds while the onboard USB 2.0 and gigabit Ethernet ports offer great flexibility in transporting the compressed video stream through wireless (such as WiFi, LTE, etc.) and wireline interconnections to remote and cloud side for archiving or further processing. The micro SD memory card interface can also be used for local storage. The module also features audio encoding from either embedded SDI/HDMI audio channels or a separate 3.5mm audio jack socket. The module is supplied with a bundled software package that demonstrates a streamlined workflow from video acquisition, encoding, streaming to archiving in a hassle-free approach for simplifying system adoption and integration effort. The well-defined web-based software APIs open the possibilities for customization based on the final usage cases. With a small physical dimension and low power dissipation characteristics, VEGA-2000 can be easily applied to portable and mobile broadcasting, medical imaging, UAV (Unmanned Aerial Vehicle) applications, etc. where real-time and high-quality video content needs to be captured and transported in an efficient way using the latest HEVC compression standard.